The Deutsch-Englische Gesellschaft (German-English Society) was founded in 1949 upon the initiative of Lilo Milchsack and six other dedicated citizens of Dusseldorf. The Gesellschaft’s aim was to restore good relations with neighbouring peoples, lead Germany back into the circle of western democracies and establish respectful rapport with the former war adversary. During the Third Reich the Milchsack Family retreated into so-called “inner emigration” which after the war facilitated their establishing good relations with the British Occupation Authorities, especially with Sir Robert Birley, the Military Government’s Educational Adviser. This good relationship enabled the Milchsacks in 1950 to organise the first German-English Talks in Königswinter. The Military Government helped provide suitable contacts to Members of Parliament, government officials, academics, businesspeople, industrialists and cultural figures. The Königswinter Conference became an annual event. It first took place in Britain in the 1960s, and since 1975 it is organised on a regular basis alternately in Germany and Britain. It has developed into a high-profile forum for decision-makers from both countries. To this day, the Königswinter Conference is the Deutsch-Britische Gesellschaft’s central project. More about the Königswinter Conference. English Language Lectures in Dusseldorf and Other Cities. 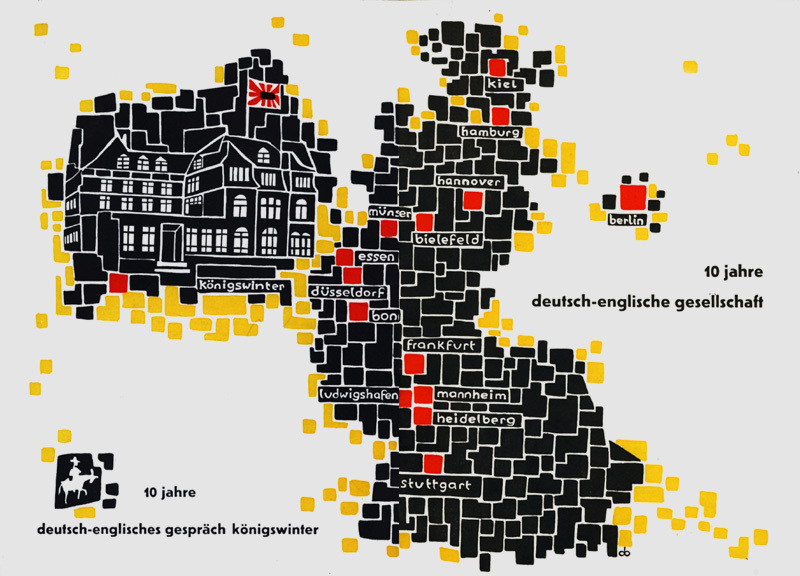 Another branch of activities developed parallel to the Conference – organisation of nationwide public lectures and discussions by and with British people as a contribution to promoting German-English understanding in the German population at large. After years of isolation from international influence, Germans had a strong desire for intercultural exchange. As Königswinter Conference themes touched upon international issues of the day they were relevant for many politically interested citizens. A logical extension of the Conference was to invite speakers to lecture on their chosen topics before a wider audience, an invitation which many conference participants gladly accepted. The structures established in Dusseldorf soon found positive feedback in other parts of Germany, too. Many interested Anglophiles were happy to join activities promoting German-English understanding. Under the guidance of the Head Office in Dusseldorf (later located in Bonn, now in Berlin), several regional branches were formed. Today there are 13 networks throughout Germany. In recent years 120 annual events are organised nationwide. In 2001, the members’ assembly passed a resolution to change the original name Deutsch-Englische to Deutsch-Britische Gesellschaft e.V. in order to reflect the new political realities of the United Kingdom. On our timeline you can see some important milestones in the history of the German-British Society so far. Please click here for a list of all speakers since 1949, recent Conference reports and other important documents on the history of the Gesellschaft. Governance of the Gesellschaft lies with the Governing Board. It determines the guidelines under which the Gesellschaft operates. All board members are appointed on a honourary basis. Information on its members can be found here. Always informed about current events.